Today we’ll look at making some yummy pasta sauces from scratch. Yes, even in the summer your slow cooker still comes through in a big way. I love the way you can take your CSA or farmers market jewels and turn them into sauces for a great pasta dish. They even freeze well for last-minute meals now or when tomato season is just a vague memory. These sauces are amazing with bread sticks and can even be the base of a grilled pizza! 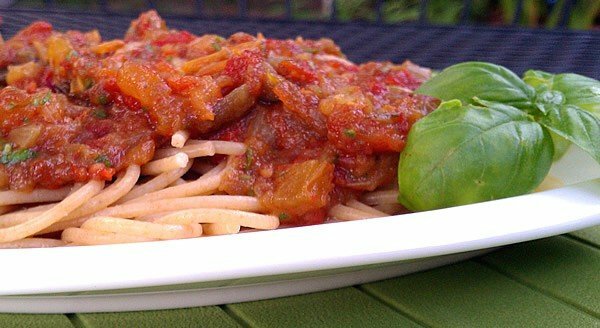 Slow Cooker Summer Pasta Sauce with Fresh Basil not only takes advantage of tomato season, but adds in eggplant, peppers, and fresh basil. 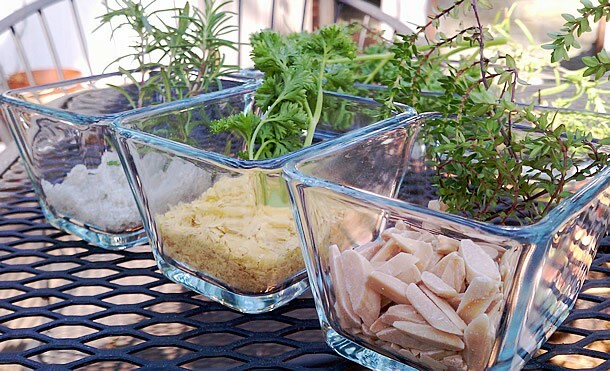 You can also sneak in some other veggies or fresh herbs that you find in your garden. Think of Slow Cooker Hide and Seek Veggie Pasta Sauce as a base to puree the veggie that you love and your family can’t stand. The base recipe adds in carrots and green pepper, but you can also add cauliflower, kale, baby turnips and more. Just make sure you don’t use too much green or they’ll know something’s up from the color change! I cook my pasta on the burner we have on our grill if it’s an unbearable day. I may still get a little hot and sweaty, but at least I still have a cool house to go back into! The only thing we’re missing is a nice cheezy topping. I make Vegan Almond “Parmesan”. It’s quick, easy and can be done in a small food processor at the last minute. Oh – it tastes really good too. 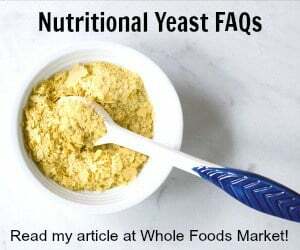 It’s salty and has that wonderfully cheezy flavor that the nutritional yeast brings with it. You can make a big batch and store it in the fridge for weeks. Pumpkin and White Bean Lasagna – one dish meal! 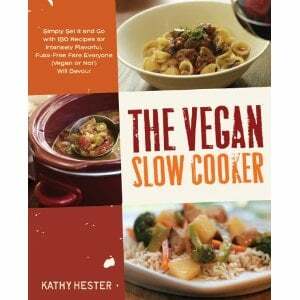 If you haven’t already written a review of The Vegan Slow Cooker on Amazon be sure to stop by and tell people why you like it and mention some of your favorite recipes! Looking for a cool drink? Check out my Lychee Pina Colada recipe on the Key Ingredient blog today. 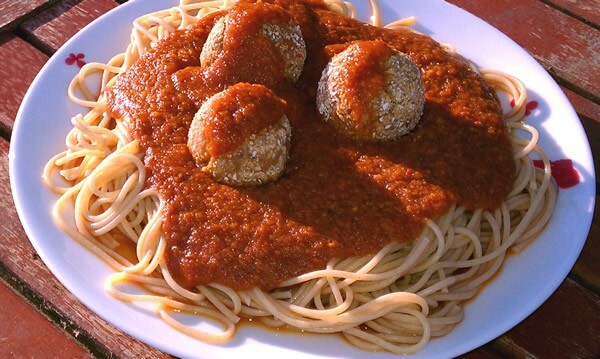 Your hide-and-seek sauce reminds me of my Magic Pasta Sauce, I use mine for using up leftover veggies. I was just cursing the freezer full of vegetables waiting to be sauced, because it’s too hot to run the slow cooker, but your comment about the BBQ burner has given me a great idea: just stick the slow cooker outside! summer slow cooker recipes are the best! i love the fresh basil! I love your book . Have made lots of the recipes . I have a question about beans. I made the garbanzos they were perfect. I froze them. My question is should I freeze with any liquid? I didn’t and they seem fine. But for future batches of like black beans etc can you tell me how you freeze them? I have frozen beans without the broth and with the broth. With something like garbanzos I tend to drain first since they hold up, but if it’s a mushier bean I will go and add a little bit. Honestly, I don’t think it matters either way. If you love to cook with the bean broth by all means freeze it with the beans or separately.